Cruises from Vancouver to Hawaii - Cruise Lines Comparison! Cruises from Vancouver to Hawaii take you on a fascinating journey down the west coast and then out to the South Pacific to the lovely island chain where you visit several islands all on one vacation. Hawaii cruise vacations allow you several days at sea to explore the ship and all of its amenities before heading off to the first port of call, but which line should you choose? 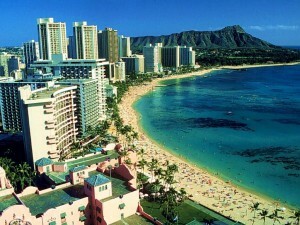 Hawaii cruise deals can be had on any of the lines taking to the islands this year. Carnival, Royal Caribbean and Holland America all set sail from Vancouver, the perfect place for your vacation to commence. One of the big determining factors may be whether you want a round trip or a one way vacation. Cruises from Vancouver to Hawaii offer both, with Royal Caribbean’s 10 or 12 night outings that have their end port in Honolulu. On the 12 night cruise, you are aboard the Rhapsody of the Seas and visit Hilo, Mount Kilauea, Kailua Kona, Lahaina and Nawiliwili. The 10 night sister cruise is aboard the Radiance of the Seas and while it visits most of the same ports of call, this cruise leaves out Nawiliwili which you are free to tour yourself after you leave the ship. Carnival’s Alaska cruises from Vancouver make Long Beach, California their end port, after cruising to the islands and visiting Honolulu, Kahului, Nawiliwili, Kona and Hilo. At 15 days in length, it gives you plenty of days at sea to check out why Carnival’s ships are nicknamed the ‘Fun Ships’ at sea. For a true Vancouver to Vancouver round trip to cruise, Holland America is all you could want and more. Their 17 day ‘circle tour’ visits Honolulu, Lahaina, Hilo, Nawiliwili and Victoria, BC before heading back to its departure port. Aboard the Zaandam, this cruise gives you the best of everything in cruises from Vancouver to Hawaii; a great ship, lovely ports of call and a door to door cruise that means you don’t have to pay extra to get home again once you disembark. The Vancouver cruise terminal is also the starting point for many cruises to Alaska, one night jaunts to Seattle and 45, 74 and 35 day tours that can take you to many ports of call as you make your way around whole sections of the globe in one vacation. It is a bustling port and one that is nestled amid beautiful scenery in a world class city that is easy to access from anywhere. Cruises from Vancouver to Hawaii allow you to see all of the highlights of the most popular islands all while only unpacking the once. Enjoy!